Here’s a quick dish I threw together. It’s easy and so tasty. I marinated two 8 oz tuna steaks with a marinade made of a few tablespoons of soy sauce, a teaspoon of sesame oil and a teaspoon of prepared wasabi paste. The fish was marinated for 15 minutes. 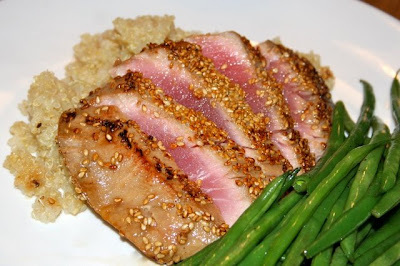 I pressed the tuna steaks into a bowl of sesame seeds and pan seared it for about 2 minutes on a side in a bit of olive oil. It was tasty and delicious! I served it with quinoa and green beans.